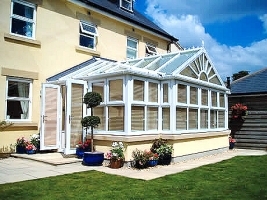 A Gable conservatory is also sometimes referred to as a Pavilion Conservatory. The name Gable is derived from the main visual feature of the roof which, although it is an apex roof, has one side upright and the others sloped – so that it looks similar to the gable end of a house. Some call it the Pavilion conservatory because, once again due to the roof shape, it is reminiscent of a traditional pavilion. 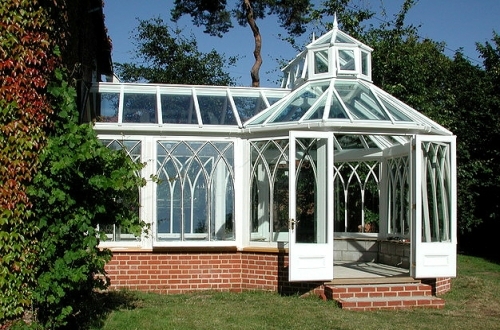 The Gable conservatory can feature visual styling from both Edwardian or Georgian conservatories, and as such, tend to fit well in the category of period designs. With the overall objective of being a regular (square or rectangular) shaped extension that brings a lot of natural light into the home. 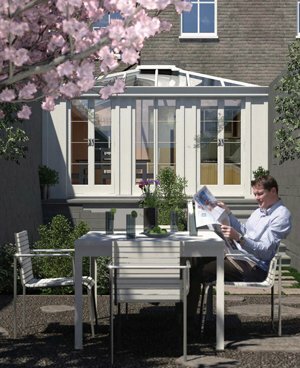 What do Pavilion or Gable Conservatories look like? As briefly mentioned beforehand, the basic shape of a pavilion or gable conservatory will either be a square or a rectangle. The styling of the room generally favours the look of an Edwardian conservatory with minimal detailing, large glazed sections that bring in loads natural light and offer a more unobstructed view of your garden. Some prefer to go with the styling of the Georgian period room that have more detailing with cornices and corbelling and more elaborate glazed panels. Whichever primary appearance you prefer, both work well with low level dwarf walling. At the top of the wall frames, the roof for a standard room will have 2 sloping sides and 1 vertical side. The vertical section is usually fitted on the longest / widest side of the conservatory – so that in profile it looks exactly like the gable end of a house. As with its “cousins” the Edwardian or Georgian style, Pavilion & Gable conservatories combine nice regular lines and good proportions to offer a very practical and appealing appearance. The Gable conservatory style works very well in combination with others, such as the lean-to, to form very attractive bespoke designs like the Gable T-shape. As a “regular-shaped” pitched roof it also works well with tiles or slates used in place of glass – it really makes the conservatory look more of an original part of the property rather than an extension of it. Many times you can see French patio doors used where the styling leans more towards a period room, but, modern and contemporary versions lend themselves well to the use of larger “picture” doors such as bifold. As with a lot of medium to large conservatories, adding some low level dwarf walls can bring a new dimension of character to the room. The material that you use for the frames will have an impact on both appearance and cost, with the primary choices being timber, aluminium or uPVC. For timber you could use hardwoods or even engineered lumber, both of which have long lifespans and amazing visual appeal. It’s not very often that you see a poly-carbonate roof on pavilion or gable conservatories, as they don’t really fall into the “budget conservatory” bracket – most rooms of this style would be medium or larger examples. 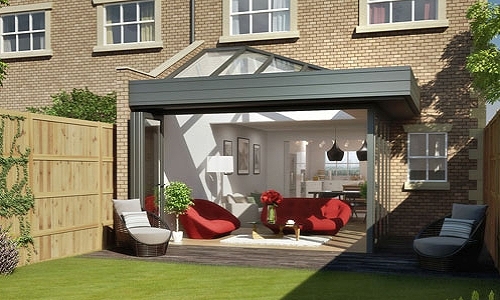 Full glass roofs are well suited to this design and with the advent of solar control glazing, self-cleaning glass and very low U-value double glazed roof panels, the room temperature can be managed very effectively to allow comfortable use throughout the year irrespective of the weather. Integrated or aftermarket blinds or shades fitted to the glazed roof are also an excellent way of controlling the amount of natural light & heat. Concrete tiles / Clay tiles– in terms of cost per tile, concrete tiles are relatively inexpensive, but clay can get pricey. Natural Slate – a real classic in terms of colour and appearance, but be prepared with a healthy budget. Synthetic slate & tile – these days there is quite a decent product range in the market. Prices vary greatly, but the choice of design, colour and material is very good. They are also very light and last a long time. 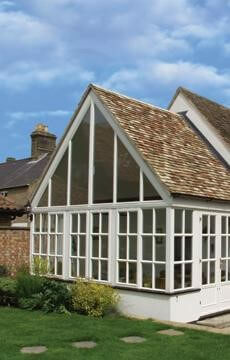 Which material is best for Gable Conservatories? The frames of the walls and roof are what give the conservatory its core visual appearance and each material used has its own Pros & Cons. 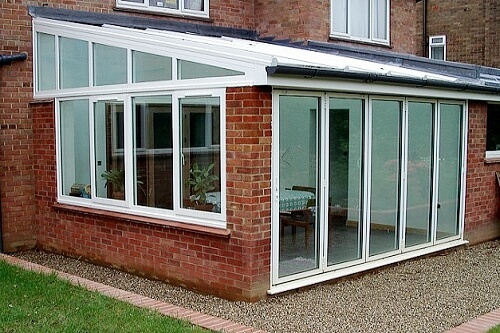 uPVC – used extensively for building conservatories. It lasts a long time, is relatively less expensive than timber or aluminium. Timber – softwood frames need a lot of TLC to keep them going. Hardwoods & Engineered woods maintenance demands are lower (and we feel they look better), but will cost more. 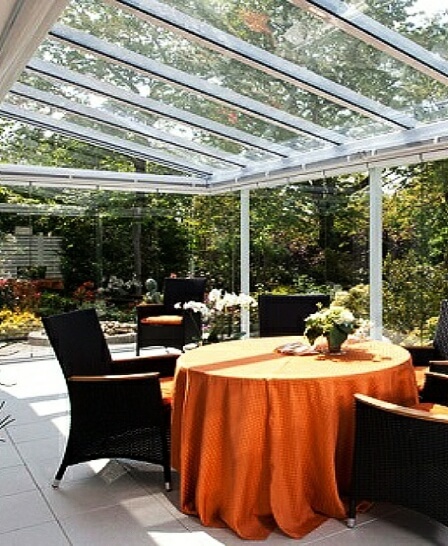 Aluminium – Some of the latest aluminium conservatory designs are super. The lightweight / strength combination of this material allows designers to do things you can’t do with timer or uPVC – but will cost a lot more than uPVC or most timber designs. 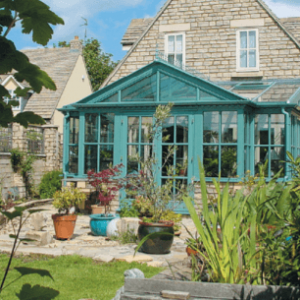 How much do Pavilion or Gable conservatories cost? The caveat here is that prices are particularly sensitive to individual requirements and can be subject to significant differences from project to project. However, you could find supply only gable conservatory prices for a room sized 5000 mm x 6000 mm (dwarf wall) around £9,500 to £11,000. With fully fitted gable conservatory prices for a room sized 4000 mm x 4000 mm you could expect to pay from £14,000 to £16,500. 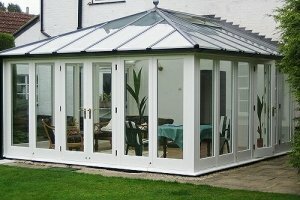 For different types of conservatory cost guides, go to this page.